Sightings of Bigfoot/Sasquatch have been occurring in North America and a round the world for well over 200 years. The creature has been dubbed America’s quintessential monster but we know little more about the beast today than we did during the “Bigfoot craze” of the 1970′s. If there was one constant among the lore of the Sasquatch, it would be that there is a certain, typical profile associated with a Bigfoot sighting/encounter. In the vast majority of encounters with this elusive creature across the world there are number of commonly observed scenarios which present themselves typically. And it doesn’t matter if the creature is known as Sasquatch, the Abominable Snowman, the Yeti or even the Yowie from Australia, they all act in a similar manner. In fact, they act so similar most Bigfoot investigators believe their all the same type of cryptid in one way or the other . This is not to say that there is a universal manner in which all Bigfoot sightings adhere to. Rather, this just means that there are certain components and actions common with seeing the creature since the behavior of the creature in its natural habitat are constant. As most animals in the wild behavior is a constant, unless threatened in some form or fashion. In the case of Bigfoot most researchers believe they have no natural predators and the biggest threat to their livelihood are in fact human beings. Many folks are seeking them out in order to prove they exist while others so-called Bigfoot hunters are seeking fame and fortune. Unfortunately, in both scenarios people are willing to hunt them down and expose them to the world dead or alive. A significant number of Bigfoot sightings occur at night. While it is not the case that all Bigfoot sightings are nighttime events, the vast majority of sightings are nighttime affairs. The reason for this is that Bigfoot is considered a nocturnal creature. As such, it will not search for food or traverse around during the day. At night the creature will likely move around more which increase the odds of it being seen. However, the cover of darkness reduces the chances of it being seen too far less than what would be the case during the day. 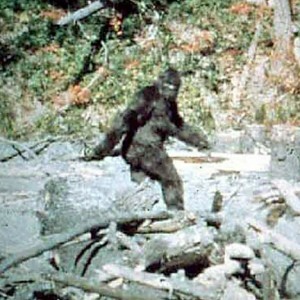 Almost all Bigfoot sightings are by accident. Other than the infamous Patterson/Gimlin Film, it is extremely rare sightings occur when on an actual hunt for the creature. One would have to assume the creature becomes “spooked” when humans are chasing it, making it less likely the creature will move around out in the open. Bigfoot sightings are common on roads and by streams. The reason for this is that it is much easier to actually see the creature in the open than it is in the brush. If the creature needs to cross a road or wishes to drink from a stream, it must leave the brush and opens itself to exposure. It is essentially leaving behind its natural camouflage anytime it leaves the brush/woodlands exposing itself to possible human intervention. Bigfoot creatures are extremely docile and likely to avoid humans. They do seem to be used to humans and do not become startled when meeting humans. These creatures do, however, wish to avoid humans and will immediately wander off as soon as they come across a human traveler. It is thankfully exceptionally rare that instances of aggression are reported when discussing human interactions with Bigfoot. Bigfoot sightings are often preceded by the noticing of a foul stench in the air. This is why Bigfoot has been given such names as “Skunk Ape” in places such as Florida. In a way, it is unfair to dub Bigfoot as “smelly” per se; as all wild animals smell pretty bad out in the backwoods. Just for clarification, a skunk ape seems to be a type of smaller version of a Sasquatch which has been allegedly spotted in the swamps of Florida. It apparently has a putrid smell when encountered hence the name skunk ape. While Bigfoot sightings are certainly random as far as we can tell, there are certain common traits which occur regularly during these encounters. Since Bigfoot remains such a mysterious and elusive creature, its actions are difficult to predict and consequently study. We do know, however, how the creature commonly acts based on recorded sightings of the beast. The information above was based on Bigfoot researchers and general people who believe Bigfoot is real. For the skeptics, all this is simply animal misidentification and or hoaxes perpetrated for money and fame. Only time will tell if any of these alleged creature encounters will ever lead up to something substantial in terms of evidence of their existence. do they harm humans if they come close to one? Have you ever heard of a human being harmed by bigfoot, lol? No, not harmed, but Janet Reno was impregnated by one! the only thing for me that gives the legend any real status is that President Theodore Roosevelt saw one while hunting in 1893. He was a very experienced hunter and big game person, not likely to mistake a bear for a bigfoot!, he said it was unlike anything he had ever seen in his life! Plus several american Indian tribes have talked about and told stories of Sasquatch for 200 years. Before money or hype or TV was involved and made statues and totum poles of him, ie: no reason to lie or make it up. Im just sayin. For I Bigfoot is a mysterious creature that supposedly ape that inhabits the forests of the Pacific Northwest region, North America and will continue to be a mystery. I do believe in this kind of mysterious creature. I heard a lot of the bigfoot stories when I was a kid and growing up. There’s got to be something out there for all these stories to be around . if its really existe it would be amazing that he was not found by enyone for so long. Bigfoot (also known as Sasquatch) is the name given to a mythological simian, ape, or hominid-like creature that is said to inhabit forests, mainly in the Pacific Northwest. In North American folklore, Bigfoot is usually described as a large, hairy, bipedal humanoid. The term sasquatch is an Anglicized derivative of the Halkomelem word sásq’ets. Scientists discount the existence of Bigfoot and consider it to be a combination of folklore, misidentification, and hoax,rather than a living animal, because of the lack of physical evidence and the large numbers of creatures that would be necessary to maintain a breeding population. Occasional new reports of sightings sustain a small group of self-described investigators.Most reports of sightings are attributed to being various animals, particularly black bears. Both Bigfoot believers and non-believers agree that many of the sightings are hoaxes or misidentified animals . Bigfoot sightings or footprints have, in some cases, been shown to be hoaxes. Author Jerome Clark argues that the Jacko Affair, involving an 1884 newspaper report of an apelike creature captured in British Columbia, was a hoax. Citing research by John Green, who found that several contemporary British Columbia newspapers regarded the alleged capture as very dubious, Clark notes that the Mainland Guardian of New Westminster, British Columbia, wrote, “Absurdity is written on the face of it. When i was in my childhood i always believe on this kind of mysterious creature. My grandmother were telling such types of so many stories, i was interested to listen such types of stories. But when slowly i grow up i came to know something out there for all these stories to be around . I think this creature though look like an ape, but maybe different than the ape. Maybe, these are very intelligent creatures but in the phase of extinction. So, are sighted only at night. If they are discovered, they should be conserved not harmed. what would you do if you caught one grab it around one of the legs and holler I got me one ! On April the 9th. in the year of 2019 we were driving at about 75 miles per hour down Kentucky Bluegrass Parkway at about 4:00 pm and were at about mile marker no.44 between Lexington, Ky. and Elizabethtown, Ky. We were driving from East to West and it was a sunny spring day with the temperature around 75 degrees. Before the sighting Janice did not have an opinion or belief about the reality of a Big Foot type of creature. She was not on any type of medication except for heart medication and vitamins. She is a slender build woman who is in very good health and had been walking at the Ark Encounter in Kentucky before we left to return back to Tennessee. Janice was in the passenger seat and looking North out of the window and saw the following : A very tall creature with a shinny black fur from top to bottom with a gorilla type looking face. It had a muscular build and was walking upright from East to West with long arms that reached to below it’s knees. It was taking long strides and moving with the speed of a fast walk, not a run. it walked in a parallel direction to the Parkway at about 150 feet away and turned it’s face southward to look at us as we drove by. It never stopped walking and the field was slightly wooded behind the creature while it was walking through a large clearing. This account was written by Janice’s husband of 54 years.